Mark Donovan, of HomeAdditionPlus.com shows how to remove a fiberglass shower pan in this video. Removing a fiberglass shower pan requires a drill and drill bit, a flat bar, and a large common screw driver. The trick to removing a fiberglass shower pan is to drill out the rubber flange compression seal around the shower drain pipe. Once the rubber flange seal has been adequately drilled out, and any anchor flanges have been removed from the wall studs and fiberglass shower pan base, the shower pan should lift easily out. 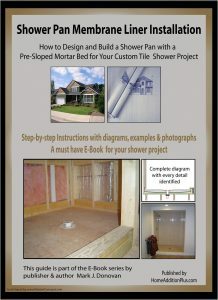 For information on how to tile a custom ceramic tile shower, see the “How to Tile a Custom Ceramic Tile Shower eBook” from HomeAdditionPlus.com. 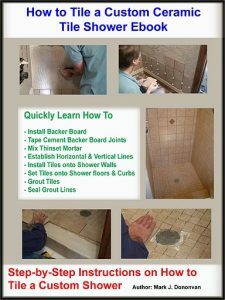 This eBook will quickly provide you with step-by-step instructions on how to measure and install ceramic tile in a shower, including the installation of tile on shower walls, floors and curbs. It provides detailed instructions for every step in the process of tiling a custom ceramic tile shower and is loaded with instructional pictures! Fill out our 3-5 minute quick and easy form, and receive a free price quote on a bathroom remodeling project from one of our pre-screened and licensed bathroom remodeling contractors. This process is free and there is no obligation to continue once you receive your bathroom addition price estimate.